While Intel has dominated the high-performance CPU market for years, AMD continues to provide value to those on a budget with their reasonably attractive range of APUs. Today, the company has announced a new APU, the A8-7670K, that slots into their 'Godavari' line-up alongside the A10-7870K. The A8-7670K is an affordable socket FM2+ APU built on a 28nm process. It features four Excavator CPU cores clocked at 3.6 GHz with a turbo speed of 3.9 GHz, as well as six Radeon R7 graphics compute units clocked at 757 MHz, and 4 MB of L2 cache. 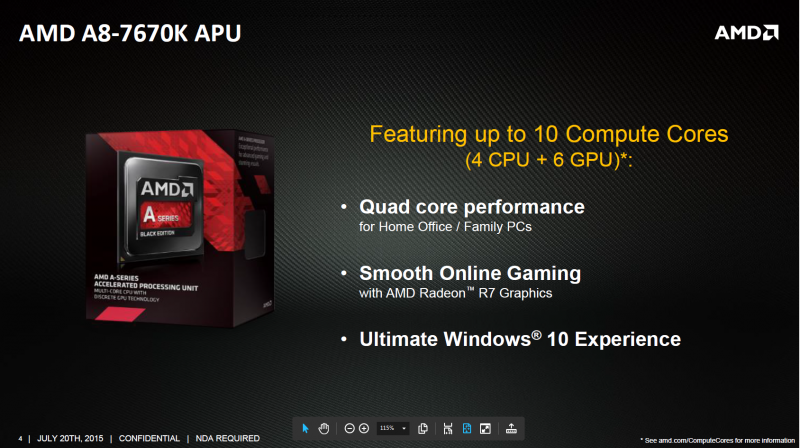 Essentially this APU is a revision of the older A8-7650K with higher clock speeds across the board. According to AMD, the A8-7670K unsurprisingly outperforms a more expensive combination of an Intel Pentium G3258 CPU and Nvidia GT 730 GPU in a range of popular PC games including Dota 2 and Counter-Strike: Global Offensive. Due to stronger integrated graphics it's also faster than Intel's Core i3-4160 in compute workloads, even though Intel's Core i3 has superior CPU performance. AMD fully supports Windows 10 and DirectX 12 running on the A8-7670K, and the APU also supports FreeSync, Dual Graphics, and Virtual Super Resolution. These features are also supported on AMD's older Kaveri APUs, so it isn't a surprise to see the features supported in Godavari products. The A8-7670K is now available from a range of retailers for $117.99, two dollars less than the Intel Core i3-4160.